A healthy rain gutter system protects homes from expensive damages to their foundation. If your gutters are cracked, broken or clogged, call Legends Roofing now for a new gutter installation in Dallas, TX. We carry a beautiful selection of gutter guards and rain gutters that reinforce foundation protection. Legends Roofing specializes in replacing, repairing, and installing all the components of roofing for residential customers. Gutter work falls into this category and to offer you a premium gutter service, we provide and install gutter guards. Gutter guards will help keep debris and leaves out of your gutter so you won’t have to schedule as many cleanings and certainly fewer repairs. For new gutter installation or to learn about gutter guards call 214-321-3293 today. You can set up an appointment for repairs or pick out a new gutter design from our selection. Proper rain gutter installation will protect your home’s foundation and the house exterior. Does your Gutter Need A Replacement? Rain gutters carry rain and excess moisture away from your home to protect your foundation and your siding from water damage. If you’ve got a sagging rain gutter, or you’ve noticed leaks and water damage to your siding, it’s time for a gutter replacement. During the fall and winter especially, homeowners should continually check for clogs and damages to their rain gutters. To help with this you can hire a Legends Roofer for regular maintenance, repairs or gutter replacement. We’ll help you make sure your gutters stay clean, intact and flowing smoothly. A healthy gutter system is an essential part of your roofing system. Without it, you’ll suffer costly repairs on a regular basis. Gutters need maintenance to support your roof properly. If your gutter has fallen past the point of repair, choose a new gutter system that will accent your home while getting the job done. 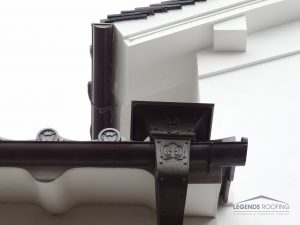 Legends Roofing contractors recommend opting for gutter guards, long pieces of protective rain gutter material that protect the gutters from leaves and debris. We offer a large range of different gutter and guard materials to choose from. As the most popular type of rain gutter for residential homes, you’ll benefit from the weather resistance of an aluminum rain gutter. You can choose the color of the rust and waterproof coat to match your home’s exterior. For a distinct look, choose copper gutters, which are known for longevity. This type of gutter doesn’t need to be replaced as often as other gutter materials and with regular repairs by Legends Roofing you’ll save money. Legends Roofing will happily clean and maintain gutters as well as fit a gutter installation for you. We recommend regular repairs and cleanings to avoid early replacement and to practice upkeep of your home. Call us at 214-321-3293 today for more information on gutter installation in Dallas, TX. Updated on August 4, 2017 at 2:28 pm by Legends Roofing.